GHL Exhaust w/Eisenmann Tip - w/Drone Killer! Hey I just wanted to show how I took the GHL Exhaust (sounded great but the drone got insane at 2700-3000 rpm. 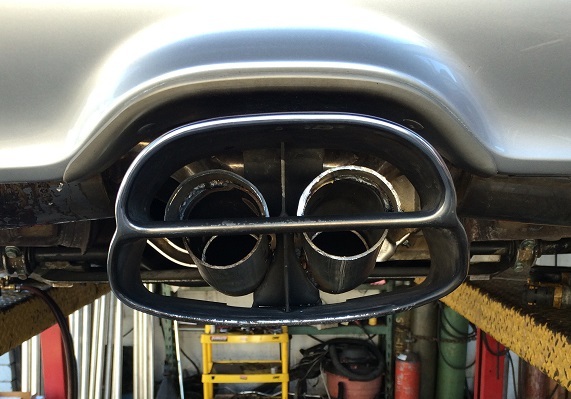 Top Up even more maddening) and changed the twin tips to an Eisenmann Tip. I found the tip on Ebay for $90 delivered. The original twin tips protruded too far - the resonators added to the drone as well. 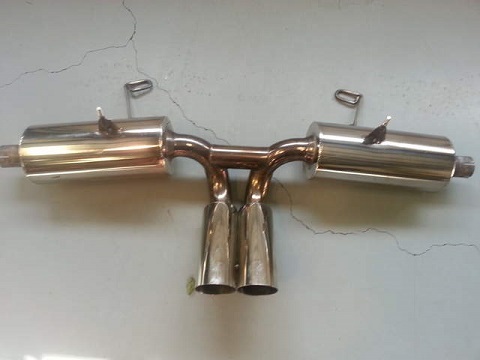 I got the exhaust from a guy whose wife complained and it sat in his garage taking up space for $120!!! Like new took it off his Boxster after 80 miles. I also used the Car Chemistry builders kit baffles to virtually eliminate the drone. Single baffle on each side worked great spent a total of $55 for the baffle rings and the center tube. Ordered it directly from car chemistry. I used about 3.5 inches of core tubing in the left baffle and 5 inches on the right baffle. I didn't use twin baffle rings nor longer tubing so not to change the sound drastically or add unwanted back pressure. Labor was only $90!!! I was quoted over $200 at some so called reputable shops (more like they see your car and charge accordingly). The price was to remove the existing tips and fabricate tubing to mount the new tip and install the baffles then mount it all back up. Plaza Muffler (the ORIGINAL location on 1st in Santa Ana, CA) did the work. I hope you like the look as much as I do and for those of you with drone problems of which I know there are many - take a look at Car Chemistry to solve your headaches. 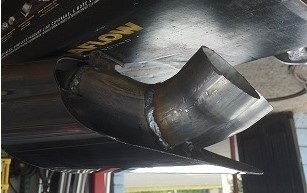 Eisenmann Tip with plumbing before it was attached. All Mounted up with baffles - BTW they didn't kill the sound at all just got rid of about 90% of the drone and vibration at 2700-3000rpm. You can see the baffles inside the tip. What size baffles did you order? Great idea!! I got the 2 inch baffles but they make them in all of the standard sizes. If your problem is REALLY bad I recommend using 2 baffles per pipe in at least ONE side. Also they provide "choke" type fittings if you need a bit more when you order the baffle insert core. A trick to kill drone as well is NOT to make them identical on each side. A single baffle on one side or 2 baffles on one side and 1 on the other. What you are doing in a true dual (individually from the headers) fed system where they exit side by side is to change the harmonics so while they sound the same to the ear but they are harmonically different to cancel out eachothers drone frequencies. I hope that helps. The left and the right are a bit different in length on my insert cores. 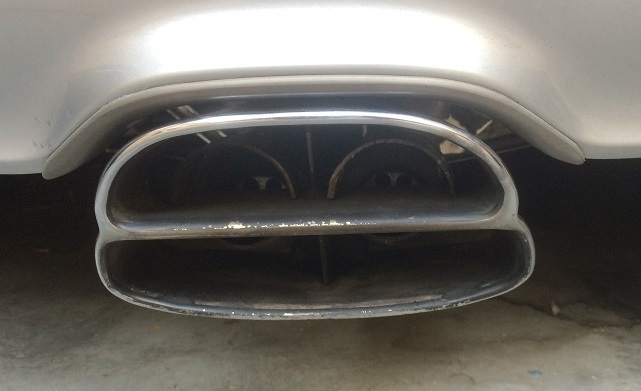 You don't have to put them at the end they work at the intake point of the muffler as well. I also have a GHL that I want to tone down. It sounded great on the 3.2 but did have some drone. With Jake Raby punching it out to a 3.6 and I will be running straight headers and cat delete pipes so I'm going to make an assumption she will be loud/drone. I like the GHL tips so I plan on installing inserts into the muffler inlets. My car is currently at Jakes so I can't get a measurement of the I.D. of the inlet pipes. Are the inserts you purchased regular steel or stainless ? I assume the " core " is welded to the " ring " and then the ring is welded to the ID of the pipe ? I'm also wondering if the inserts/rings can be installed further upstream ? Like at the joint between the headers and the rear cat delete pipes ? I'm thinking in the cat delete pipe itself just past the flange. I love the sound of the GHL just want to tone it down some. If you had to guess what percentage of a difference did you notice ? Would you say it's 10 % quieter or 50 % or ??? And she still sounds good when you get on it ? Thanks for the write up. Wow that sounds like a heck of a power plant. 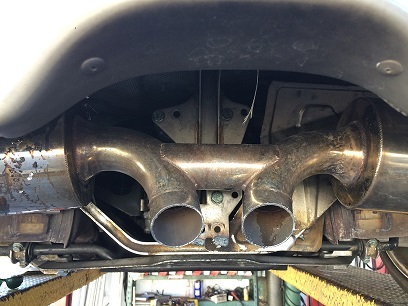 The exhaust is still plenty there but the drone was greatly reduced and YES when you step on it still howls! I would say it may be 15% quieter but the nagging drone is really reduced. The rings and to cores don't come welded together so you can choose how many baffles and how to space them out (or buy a preset kit but I preferred the builders choose your own) but you are correct as to how they are welded in place within the exhaust tube. They are regular steel but you can order them with a "coating" or just standard black. Car Chemistry also offers packing material if you wanted to pack the space between to rings. For your set up I would do a minimum double ring or even a triple if your drone is bad with all that HP. Space them out differently. Maybe 2 baffles on one side and 3 baffles on the other or a 3/4 set up due to the increase power vs my 2.5 with minor mods. They have flanged set ups too so you may be able to use them at the header exit point which works well for drone as well. I hope that helps - let me know how it works out. Last edited by Specwar; 10-19-2015 at 11:36 PM.